After 'Brexit', How Will Gold React If This EU Giant Falls Too? Home » You Saw What Brexit Did to Gold – What If This EU Giant Falls Too? You Saw What Brexit Did to Gold – What If This EU Giant Falls Too? The UK’s exit from the eurozone might be a done deal, but is there something bigger brewing in Italy? In the weeks following Brexit, gold made a leap of over $100/ounce. Market makers reacted strongly to the decision, and the result was gold’s longest rally in seven years. Investors are still seeking safe haven in the commodity today as gold rides high at well over $1300. Nobody thought Brexit would actually happen, but when the UK surprised everyone by passing the referendum, it triggered a slingshot effect that sent gold soaring. And that raises an important question: What would happen if another major European country were to leave the Eurozone? 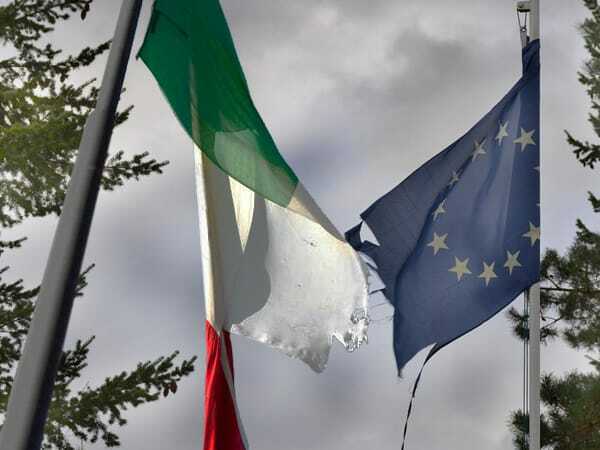 The thought of another fracture in the European Union seems unfathomable after the effect that Brexit had on the global economy, but considering the status of Italy’s banking system and the political turmoil happening there, it could be a very real and present danger. On the other hand, it could also be a tremendous opportunity for precious metals investors. So let’s break down the likelihood of an “Italeave” and investigate would it could do to the gold market. With the UK dropping out of the European Union, Italy now holds the title of Europe’s third largest economy, falling behind Germany and France. So keep in mind, when we’re talking about the possibility of Italy defaulting on its mountains of bad debt and being forced to exit the eurozone, it’s no small potatoes. The trouble all stems from Italy’s deeply troubled banking system and crushing national debt. The BBC reports the Italian government’s debt to be potentially the largest in the entire eurozone, approximately 132% of the country’s GDP. If that sounds bad, just hold onto your hats, because it gets worse. 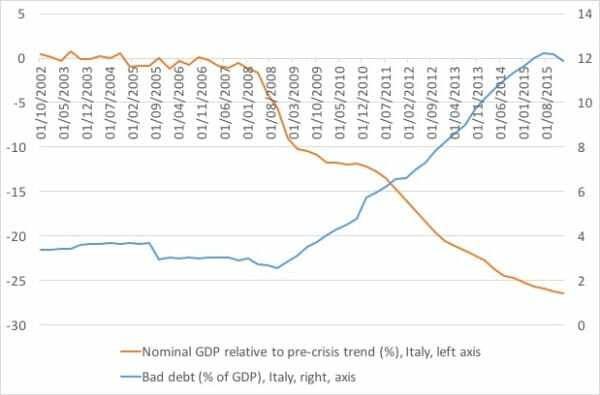 The Mises Institute recently made the important observation that the ratio of bad debt to good debt held by Italian banks is several multiples larger than it was back in 2008, when the country’s economic troubles started growing most severe. According to the IMF, roughly 18% of Italy’s government debt is bad or “non-performing”. “Downside risks arise from delays in addressing bank asset quality, intensified global financial market volatility – including from Brexit, the global trade slowdown weighing on exports, and the refugee influx and security threats that could further complicate policymaking,” said the IMF. In case the cracks forming in the foundation of Italy’s financial system weren’t enough cause for concern, there’s a huge political crisis happening over a referendum coming in October too. Essentially, the referendum would bring reform to Italy’s Senate that would allow Italian prime minister Matteo Renzi the opportunity to advance legislation to bolster the country’s economy — a last ditch effort during a full blown economic tailspin, but a legitimate effort nonetheless. If the referendum fails, Renzi will be powerless, and his government will likely cave in on itself. Societe Generale strategist Albert Edwards says that that could set off a chain reaction leading to a prolonged Italian recession, a shift in political power, and ultimately Italy’s exit from the Eurozone. If the situation in Italy develops in such a way to initiate the country’s exodus from the eurozone, we will be looking at an economic crisis much greater in magnitude than Brexit. Losing a second major EU member just months after the UK would be more than just a little Brexit aftershock; it would be a far more severe crisis all its own, and nobody’s sure if an event like that could push the world economy past its tipping point and back into a massive recession. Uncertainty is all you can count on here, and you know exactly what that means for gold and silver. The only exciting part about imagining this kind of financial and political bloodbath is to think how high it might push gold if and when it comes to pass. Brexit sent gold above its 2-year high. How high do you think it could go if Italy follows suit? Are governments around the world struggling to stay afloat? Find out here.